Get Lit 2017 | Williamson Williamson Inc. Words have the power to change lives. Get Lit is a one-of-a-kind fundraiser where a lineup of notable Canadians read from their favourite book and tell the story of how it impacted their lives. Since 2005, Get Lit’s roster of notable speakers have shared passages from one of their favourite literary works. Although authors are often featured, successful and inspiring Canadians of all professions are invited to share their excerpts with hundreds of enthusiastic attendees of all ages. To date, the reader line-up has included architects, opera singers, musicians, doctors, artists and chefs. Each tells the story of one book that inspired them, altered their perspective or impacted their lives. We meet, mingle, share our stories and help First Book Canada deliver over 100,000 books each year. 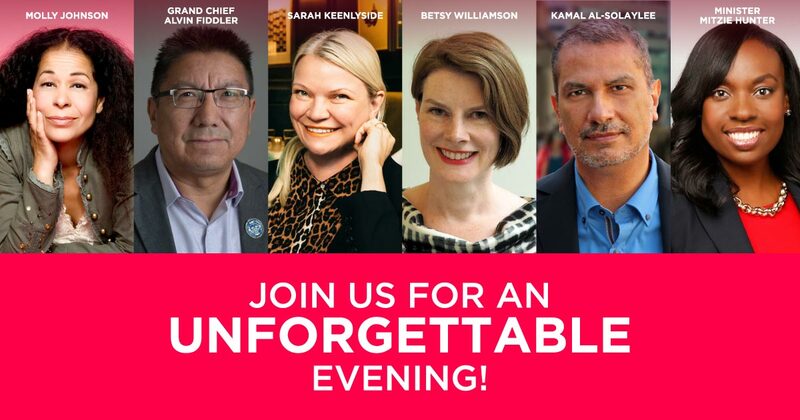 This year the speakers include jazz vocalist Molly Johnson, Grand Chief Alvin Fiddler, Sarah Keenlyside of Inkblot Media, author Kamal Al-Solaylee, and The Honourable Mitzie Hunter.